What is an M3 shop? What is an M3 order? What is an order status? In the web menu, choose Withdrawal in order to withdraw funds from your virtual wallet to your bank account. Without having a bank account defined, there is no possibility to withdraw. Go to Bank Account section for more details. Fill in the field Amount with the amount you want to cash out. Fill in the field Security Code with the security code associated to your Moneymailme account, that you have received in the welcome email when you created the business account. Note: If you have forgotten the security code or lost the email, follow steps as explained in Change security code section. The fields Applied Fee, Transferred Amount and Currency are prefilled. The Applied Fee is the fee applied to the amount you want to transfer (according to the Payment Solution Agreement that you read and agreed on upon account creation). The Transferred Amount is the amount that will actually be transferred to your bank account. The Currency is the currency of your virtual wallet and the currency of the amount you will receive on your bank account. Click on Create after having filled the required fields. Note: This is a transaction on your wallet. See Transactions section for more details. After the withdrawal request is sent for processing, your wallet balance is updated and you will receive an email confirming the processing. However, you will receive the funds in your bank account after a (short) period of time, depending on the location of the financial institution holding your bank account. In case of problems with the payment processing, your Moneymailme wallet will be refunded. 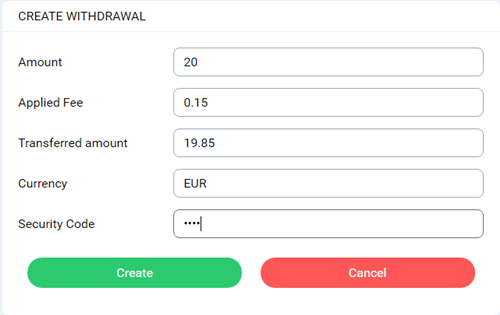 Note: The minimum amount to withdraw within a transaction is the following (depending on your wallet currency): 20 EUR, 20 GBP, 20 USD, 20 CHF, 80 PLN or 280 ZAR. There is no limit on the maximum amount to withdraw. Copyright © 2017 Moneymailme All rights reserved.